Washed up, out of shape. Overweight Mark Stewart struggles to hold himself up tall, squats down and slurps a pint of cider, before standing again, drawing upon the lyric print-outs onto large font to recall the words to each poorly-rehearsed song from over 30 years ago. The ageing crowd shake their hands and arses and skank in the old way, as the band hold it tightly together through 6 or 7 songs, before an encore where they play the first song once again, “We are all prostitutes“, with a little more gusto the second time round. 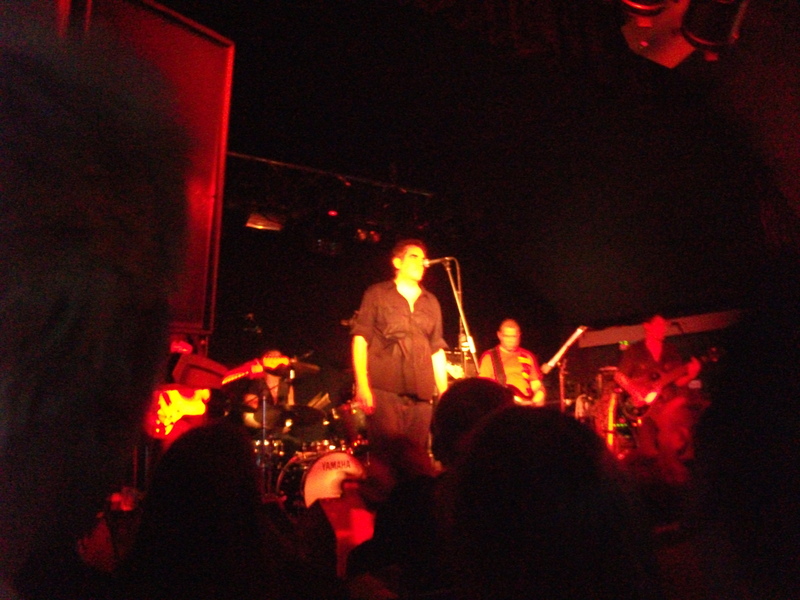 It’s a poor show, especially given Mark Stewart’s hot bursts in the past against reformations, ‘retro-philia’, and even last April boasting that the band would never reform, saying “There are too many fat men like Gang of Four trying to get attention these days.” The beer belly on Stewart as he sweats on stage, pounding his fist into the air, unfortunately catches my attention above all, and it’s unfortunate that a year and a half is all it takes to forget statements of integrity. The encore song is apt, and while the sound quality and production is excellent with good dub effects mixed live, this seems very much like another old group playing the past-punk reformation game. I vow to my brother – who paid £17 each for our 2 tickets, and I thank him, and I don’t meant to sound ungrateful – that I won’t see another reformed post-punk group. But he reminds me that it’s already too late. We saw Iggy Pop and Suicide in Hammersmith earlier this year perform each perform one of their albums in its entirety, now homogenised to rock and roll classic status. There was a reformed-of-sorts Public Image Limited in Brixton, whilst Young Marble Giants toured last year, and even Peter Hook of New Order has reopened the Factory and taken Unknown Pleasures on tour. We saw Gang of Four at the Barbican, and James Chance at the Victoria in Mile End. During the 3 years we’ve gone to Offset, as well as array of excellent new bands we’ve seen reformations of Wire, Slits, A Certain Ration, Blurt and Gramme. For two Christmases I saw a clapped-out Pogues play at Brixton. It’s too late though. These performances aren’t always entirely cash-ins – few saw James Chance – but they’re often motivated by 1. mortgage payments and 2. an understandable desire to relive youth, albeit with dire consequences. In all cultural spheres, when you hear “…is more relevant now than ever before…“ consider this the sound of death! What’s more common is the aged record-collecting audience and the equally aged band, now squatter, balder, chubbier, all reliving a youthful ritual. But we’re in our early 20s. Should we be here? It’s a wasted opportunity from the Pop Group, a short set with nothing new to offer. There was talk of a new album by the “New Banalists“ as Stewart was promising, but in the end it was just mediocre old material. Exactly what the Pop Group should not have been. But everyone seemed exhilarated as they piled out the Garage, with two inchoate inebriates comparing notes within Highbury tube: “you see their sound sounded different then. It sounds right now, not so pretentious“. Thirty years is a long time for the carnivalesque upstart left-wing funk to seep in. To be fair, the musicians kept time and played well. But it was still just not that good! While Stewart obviously had rehearsed at least Thief of Fire with the band, and the performances of She is Beyond Good and Evil and We Are Time were a little exciting and evocative of how good and underrated their first album Y is – Don’t Call me Pain and Don’t Sell Your Dreams were missing, as well as any new material at all. When I got home I listened to Y on record, with the karaoke performances at least reminded me what an exciting piece of music and punk statement that was. But they’re happy. Maybe I’ve stumbled in upon the rituals of other cultures – and I should play the kind but detached, non-judgemental observer. This might be taken as a victory by Stewart, who in interviews name-drops at least every sentence, but the tribe here is old rock and roll music and its’ admirers. Leave them to it then, and leave me out! Posted on September 13, 2010 July 22, 2011 by JD Taylor	This entry was posted in Reviews. Bookmark the permalink.